Wake-up Club, a PlayStation Vita app that functions as a social alarm clock, will release in North America on Jan. 15, 2013.The free app was first announced in April last year alongside other free apps designed specifically for the Vita. Sony describes Wake-up Club as an "interactive way to start your day. "The app functions as an alarm clock where users can personalize their alarm tone and background theme. It comes with a social twist, though. 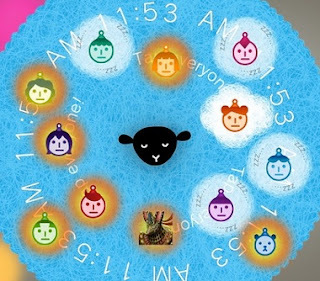 The app matches 12 randomly selected players who set their alarm clock at the same time and creates a "wake-up club. "When players wake up they can tap on their Wake-up Club avatar, which then appears in a virtual club room where other players' avatars reside. Players can see whether others in their club are awake or asleep and tap on sleeping players' avatars to "cheer them on." The app also records players' stats, such as how many times a player has woken up within five minutes of their alarm going off and how many consecutive "successes" they've had. The app is free for download from the PS Vita PlayStation Store next Tuesday, Jan. 15. Let us know what you think of free Apps in the comments below!